Music Hall, which had developed in the Victorian era from song and supper rooms and the free and easies run by public houses, provided a programme which was not entirely musical. Circus and fairground acts, as well as comic singers and speciality acts, including dancers and magicians, formed the basis of what would later become the variety performance. The theatrical element was supplied by “spectacular drama”, which in turn gave way to the sketch. The music performed came from multiple sources, such as supper room songs, ballads, and folk songs. Many halls also included an element of art music alongside the more contemporary, popular music. For example, as a result of copyright issues, extracts from Gounod’s Faust had their first performance at the Canterbury Music Hall in Lambeth, London in 1859. 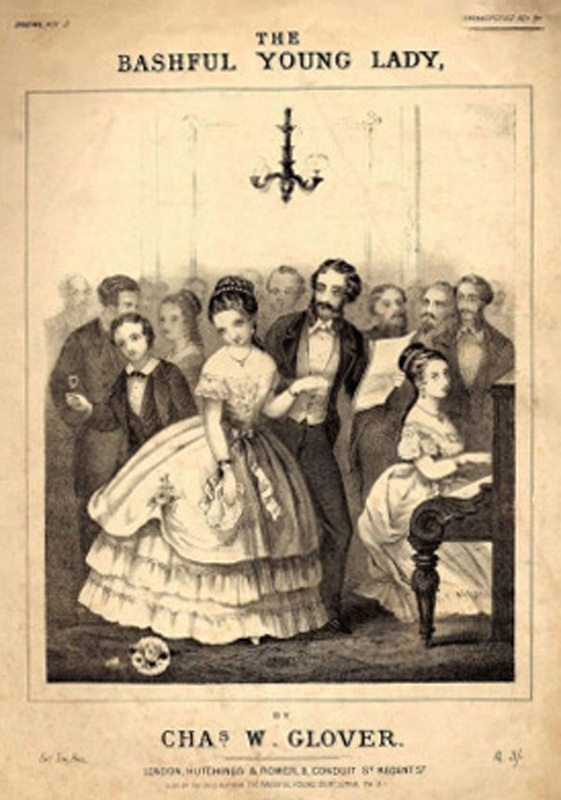 The music hall song, as a genre in its own right, began to appear in the 1860s, one of its central features being a melodic chorus designed for audience participation. Some of these songs may have been authentically working-class, but most were written by vast numbers of writers effectively producing songs on an industrial scale. Their names and biographies were all but anonymous in comparison with those of the performers who used them. To begin with performers and audiences were almost exclusively male, but gradually ladies’ nights were added, and female performers began to appear. Socially, while music hall may have been principally a working class institution, some performers came from a distinctly more middle class background. Audiences too varied: as in many aspects of life the very poorest would have been excluded, as much for want of suitable clothing as for affordability of the entrance fee and the drink. There was a “bohemian” element to many audiences, as well as relatively small numbers of the middle classes. That the music hall ultimately became both middle class and respectable is demonstrated by the establishment of the first Royal Command Performance in 1912. 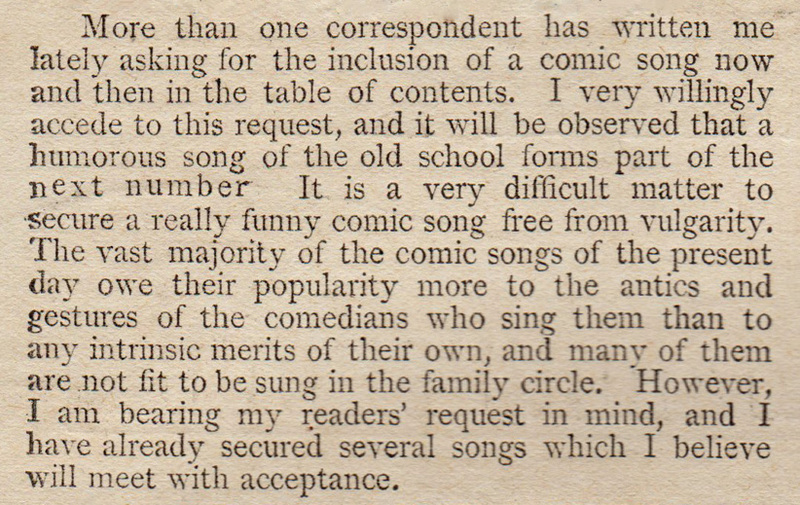 The editor seems here to be rejecting just the type of comic song which might have been popular with a music hall audience. Songs previously included had titles typical of the Victorian era, such as “When Roses Wake”, “Faith” and “I Live For Thee”, so it is perhaps not surprising that the first comic song offering, “The Bashful Young Lady”, published in Issue 12, was not a new composition, having originally been published around 1850. The music was by Charles William Glover (1806-1863), a violinist and composer, and the words by Miss Poole. The latter is likely to have been soprano Elizabeth Poole, whose career began at the age of 16 with a small part in an adaptation of Auber’s “Gustavus” at the Theatre Royal, Drury Lane in 1834. I am so confused! and my cheeks are so hot! Oh! don’t look! or indeed I shall die on the spot. What I suffered at dancing! and lessons at school! Similar items appeared in further issues, so presumably the readers were not disappointed with the editor’s selection. By the middle of 1908 the attitude toward musical hall is more positive. The covers feature not only the song but what was much more important to both music hall patrons and to the purchasers of printed music, the name of the performer who made it famous. The cover design had evolved to include simple artwork and the piano keyboard of earlier issues had gone, indicating perhaps that the readership was beginning to be more interested in following the celebrities of the day than in home performance alone. Harry Lauder was a Scottish comedian and singer who gave up work in the mines for a full-time performing career, which peaked during the Edwardian era. He was among the most highly paid artists of the time, such was the demand for his act, which was perhaps more parody than genuine comic Scotsman. 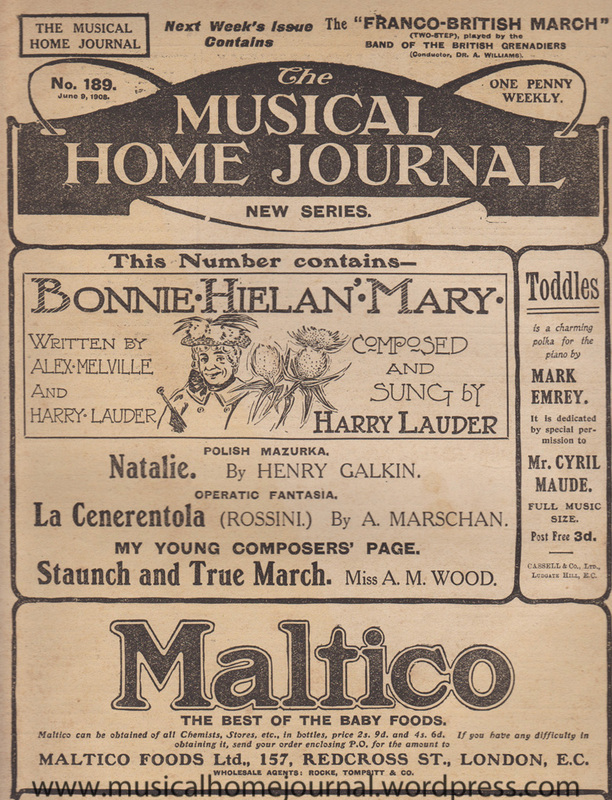 Shortly after this issue of the Musical Home Journal was published Lauder performed for King Edward VII at a private house party at Rufford Abbey in Nottinghamshire, so Music Hall had clearly become more socially acceptable than the 1905 editor of MHJ seemed to believe.